Castle Pines Village - European-inspired masterpiece on 1.62 secluded acres backing to open space with unobstructed Rocky Mountain views • Stunning resort-style pool and spa • Expansive terraces, water-features, incredible patios and pergola, outdoor kitchen and bar • Inviting interior, marked by exquisite millwork, exposed beams, and hardwood floors • Walls of windows frame majestic mountain views • Kitchen boasts Alder cabinetry, high-end appliances, an expansive granite island • Handsome study with coffered ceiling and stone fireplace • Main floor master suite with fireplace, large sitting area with dramatic views • Ensuite master bath includes double sinks and vanities, BainUltra jetted tub and huge walk-in closet • Guest suites are equally impressive, each with well-appointed baths • Lower level includes an elegant wet bar with wood and stone accents • Share your favorite vintage from the spectacular wine cellar and tasting room • Walk-out family room with fireplace, billiards area, home theatre and gym MLS#1629601. LIV Sotheby's International Realty. Call for your private showing today! MLS#8058998. RE/MAX Momentum. Castle Pines Village - A beautiful Colorado mountain contemporary home perfect for any family! MLS#4773093. RE/MAX Masters Millennium. Castle Pines Village - Luxury, low-maintenance, lifestyle • Interior boasts walnut stained oak flooring, window coverings and custom finishes throughout • Open great room includes a stone fireplace & large windows • Upgraded dine-in kitchen has slab granite countertops, center island, stainless steel appliances, 6-burner range, 2-way fireplace and glass doors that open to the rear deck • Dining room has a convenient granite topped built-in sideboard & gorgeous window treatments • Main floor master suite with mountain views, private deck access, fireplace and a luxurious master bathroom featuring a jetted tub, dual vanities, large walk-in shower and two walk-in closets • Lower level walkout is versatile and open with a custom bar, rec/game room and family room with beautiful fireplace plus flex space ideal for a media room or home-gym • Two large bedroom suites plus two bathrooms round out the lower level • Private upper level decks and lower covered patio with fireplace backs to open space MLS#9594229. LIV Sotheby's International Realty. Upon entering, the 2-story grand foyer and gleaming hardwood floors will entice you to experience all that this home has to offer- Over 6,000 square feet, multiple patios to enhance an outdoor lifestyle, a beautiful eat-in kitchen w/Viking gas range, slab granite, butler’s pantry, walk-in pantry, and double ovens- all of which is wide open to the remarkable eye-catching family room complete w/custom built-ins, a laid-back and luxurious master suite w/private patio, fireplace, custom built-ins and drenched with soothing natural sunlight, a finished walkout basement, oversized 3-car garage, DaVinci slate tile roof, large grassy areas for play, and so much more! MLS#8591079. Compass - Denver. Castle Oaks Estates - Such a great family home! Backs to Open Space! MLS#2960178. TRELORA. Kings Ridge - This home is a must see....nothing left to do on this one. Just move in and enjoy! 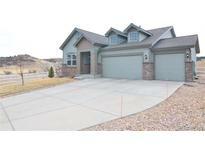 MLS#7022298. KENNA REAL ESTATE. Cobblestone Ranch - In the Summer, enjoy the Back Patio and pet friendly turf back yard with a 5-hole putting green, professionally done by 5280 Turf w Lifetime Warranty. MLS#5709087. HomeSmart Realty Group. Crystal Valley Ranch - You are also minutes away from community trails, pool & clubhouse. MLS#3292976. RE/MAX Professionals. The Meadows - Perfect for a mother in law suite or guest retreat. Move right in. MLS#7633517. Atlas Real Estate Group. Short drive to I-25, Parker Rd & the Outlets at Castle Rock! Top-rated Douglas County schools! MLS#2748441. RE/MAX Professionals. Founders Village - Home being restored top to bottom from recent fire damage. MLS#7955487. COLDWELL BANKER RESIDENTIAL 24. Part of nationally recognized Douglas County School District. MLS#5120287. Keller Williams Action Realty LLC. Home, 2 Car, St, Dw, Rf, Fp Gas, Fans, Vaulted Ceiling, Anderson Double Pane, Sprinkler, & 10' X 8' Tuff Shed. Won'T Last. MLS#2847274. MB MIKE K INC.
Castle Pines Village - *Over $250,000 invested in remodel costs and updating. MLS#8053216. LIV Sotheby's International Realty. Castle Oaks Estates - The garage has 13-foot ceilings and 8-foot garage door. MLS#8219231. HomeSmart Realty Group of Colorado. Terrain - Gourmet Kitchen with separate Dining Room. On cul-de-sac. MLS#3556135. MB TEAM LASSEN. Terrain - Full unfinished basement with 9' ceilings. Gourmet kitchen. MLS#4437131. MB TEAM LASSEN. Crystal Valley Ranch - The basement has been beautifully finished with a family/entertainment area, a flex space that is perfect for a game room and an additional bedroom and bathroom tops it off. MLS#4158900. RE/MAX Masters Millennium. Terrain - Full unfinished basement with 9' ceilings. MLS#4463151. MB TEAM LASSEN. The Meadows - 3 car garage 5-Star Energy rated SE facing home include newly carpeted main level, 2012 High impact roof, surround sound wiring, add'l attic insulation. MLS#2332727. Realty One Group Premier. Terrain - Full unfinished basement with 9' ceilings. MLS#7727099. MB TEAM LASSEN. The Meadows - There is also a paved path a block away for longer walks. Must see this lovely home. MLS#5882999. Preferred Properties Inc.
Castle North - Come and take a look at this gem before it's gone! MLS#6044067. HomeSmart Realty Group of Colorado. Plum Creek Fairway - This Castle Rock neighborhood is just minutes from downtown Castle Rock is well know as being a golf community. MLS#4074907. Keller Williams Action Realty LLC.